When it comes to doing up your kitchen, one often thinks of modular kitchen! But then there's also the option for carpenter-made kitchen... So, which one do you choose? Carpenter-made kitchens are manufactured following the traditional method, by local carpenters. They are built from scratch according to the requirements of consumers. Modular kitchens, on the other hand, are made of modules of cabinets. They give a modern outlook to your kitchen and can be easily dismantled. While modular kitchen designs have a smooth finish, carpenter-made kitchen designs can be personalised as per your needs. How do you choose which one’s best for you? Here’s a quick comparison to help you decide. A modular kitchen seems to be the best option to choose from if your style is ‘contemporary’. 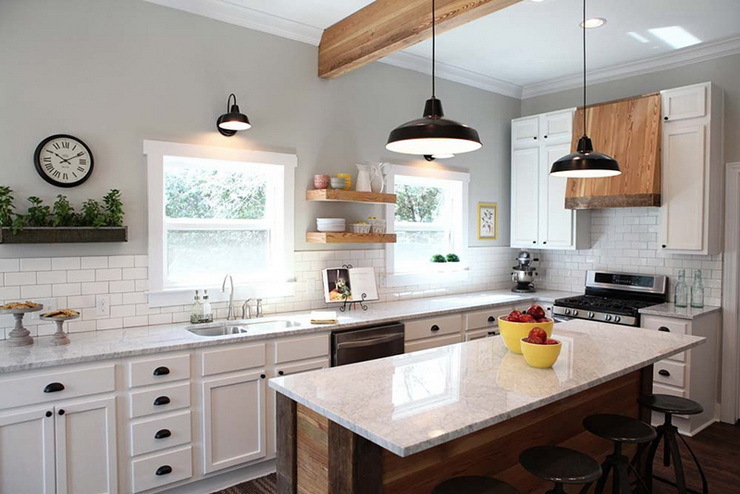 The modern layout and sleek construction make your kitchen look neat and clean. The ‘modules’ can be easily assembled and reassembled. Hence, you may effortlessly carry them in case you are about to shift to a new home. They are made up of engineered wood that is quite durable and easy to maintain in the long run as opposed to solid wood. Since they are factory-made products, they come with complete quality assurance provided by the manufacturing units. Modular kitchens can be customized according to the given space, therefore, storage is never an issue with them. Designed in manufacturing units, you need to just get them assembled at the site without any hassle of hiring carpenters and creating a mess all around in the home. You can get yourself a modular kitchen within the initial estimated budget during your enquires, as price hardly varies (provided there is no change in the final design). Good things rarely come cheap - you might need to shell out quite a bit for a modular kitchen. Modular kitchens generally start with a minimum price. So, if that is beyond your budget, there is not a lot of scope to get the price below that. If experts to be believed, even engineered wood is not quite durable. You also, have an option to get marine-ply added, which is more durable at a higher cost. Make sure your designer offers you the design similar to what you see on paper, as chances are it may vary. Before you hire local carpenters, and get them to design your kitchen; make sure you know the pros and cons! Building a traditional-styled kitchen is fairly easy, as carpenters are easy to approach and locally available. With carpenter-styled kitchen, you may always alter your design and build a kitchen that suits your pocket. Carpenter-styled kitchen are open to customization, and thus, you may always add a personal touch to your kitchen. Given that they are built entirely from scratch, carpenter-made kitchens might not match the smooth quality of a modular kitchen. Carpenter-made kitchen cabinets are permanently fixed, and thus, there is no chance that you can dismantle them and use again if you are planning to shift to another house. The cost varies according to your requirements and the charges of your carpenter. Locally available carpenters may not be aware of latest design trends - it may be hard to get them to design something that’s in fashion! Local carpenters can’t be of much help to you as opposed to designers who can visualize what your kitchen would look like after the execution. They depend on you for complete design and would often ask you for design references. Carpenter-made kitchens do not come with machine techniques like edge banding for smoother finish. It can be concluded that if you have the patience to deal with carpenters and need a more personalised kitchen, a carpenter-made kitchen may not necessarily be a bad choice! However, if you are looking for a flexible, easy-to-maintain kitchen with a smooth finish and good quality cabinetry, you should definitely opt for a modular one! Why not consult an expert to find what suits you best? Get in touch with Hipcouch today! Quick SlideShare you can download for later references and make the right choice! Older PostHow to Design A Great Home Office!